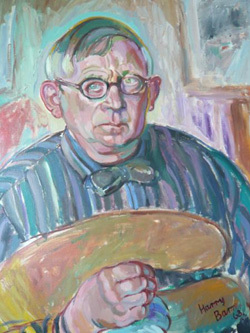 "Harry Barr was a painter"
Harry Barr devoted himself to painting over the course of his life. He was born in 1896 and died in 1987. He was passionate about painting and, in particular, about watercolour. In this medium he produced an amazing body of work. For his subjects he concentrated on nature, most often landscapes, seascapes and trees, though not exclusively. He also produced many superb portraits, nudes and animal pictures. "My opinion is on record over and over again in recent years that the watercolour, a specifically English medium, is virtually dead. I am now forced to reverse that opinion, at least in the case of Harry Barr, who is mounting his first one-man show in England in that medium. This is not the only rule for which the exceptional nature of Harry Barr provides proof. A professional painter of fifty years' standing, who gained his Art Teacher's Diploma in 1915, his first exhibition was of line drawings, held at a Bloomsbury gallery in January 1920. In the following month, arriving in Paris, he was immediately befriended by Ossip Zadkine, who found him a studio. His last important one-man exhibition was of oils, in February 1921, at a gallery in the rue Marbeuf. In those pictures one is sure, as in all his other work, his practice was empirical, learning the rules only in order, by breaking them, to produce something better. Sickert, who was for three years his teacher, and his friend for thirty, forbade him to draw outlines. For a year he did as he was bidden; then having learned to appreciate masses, and summarise them in the width and strength of a single line, embarked on a first series of outline drawings, chiefly of the female form, to which theme he returns from time to time, and which can only be termed of trascendental technique. 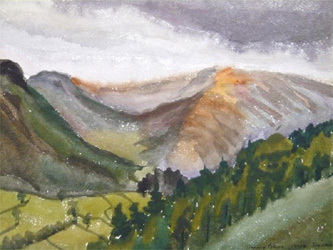 He started to paint in watercolour in 1939; and found it to be his true medium, and that in which he was most fluent. His use of watercolour is exactly the opposite of the maiden-auntly finicky kind which we have come to understand by the term. Contrarily, he works at his best outdoors in fog, rain, or snow, indeed, a number of the pictures in the present show bear the marks of sudden rainspots and even the crystallisation of ice upon their surfaces, insisting that the difficulties created by the climate act as a salutary curb to his enviable facility with brush, pen, pencil, and the other instruments with which he ferrets away at his paper. 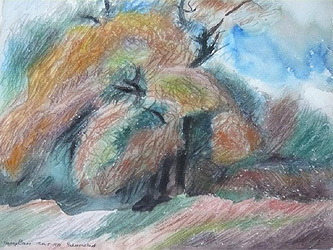 Concurrent with this first exhibition at the Kaplan Gallery in London, sixty of Barr's watercolours of the British landscape form what I believe is the first one-man show ever to be held in Russia of a British artist. This is at Friendship House in Moscow and is ultimately intended for Leningrad and Minsk also, to which cities it should already have been removed but the interest has been so great that it has been retained in the Russian capital for an indefinite period. This is not surprising, for the truth of the matter is that all his life long, Barr has produced work not to pander to some supposed public taste; nor to suit the predilections of a particular gallery owner and his clientele; but solely in order to please himself. It is the only sure way in which to please other people; and this he does, to use one of his favourite French words, with the greatest possible élan."